Paint Stars of HOPE with your children: As news stations show the destruction of Hurricane Florence, your children may ask how they can help those who have lost everything. Your children can help from home by painting stars with messages of hope and healing and sending them to survivors. Order a Box of HOPE to get started. 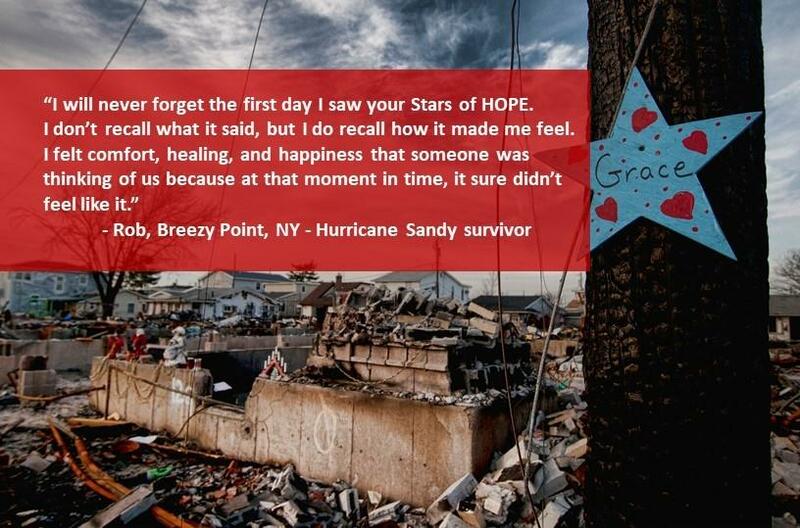 Donate to Stars of HOPE: After a natural disaster, our team deploys to devastated areas to bring hope to survivors. Painting Stars of HOPE can help survivors overcome trauma and express their feelings in a therapeutic way. Donate Now. Where do I send my Stars of HOPE after I have painted them for the Carolinas? When do the stars need to arrive at this address?